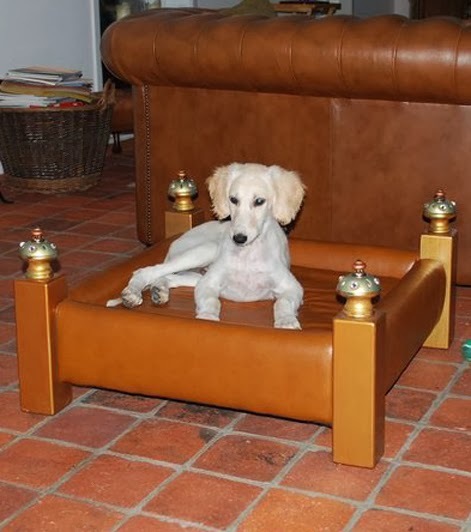 Puregoldstick: Posh Pooch Retreats - Dog beds get Susan Goldstick finials for the finishing touch. Posh Pooch Retreats - Dog beds get Susan Goldstick finials for the finishing touch. I always enjoy when interior designers contact us for a public installation or event. Most typically the focus is a decorator showcase house. But every so often a special project will involve an unusual application of our decorative hardware. One of my favorites is still the house of cards sculptures perched in the poker room at the Wynn hotel in Las Vegas. So when designer Phyllis Harbinger contacted me about a challenge hosted by the New York Metro ASID for the Southhampton Animal Shelter, it more than piqued my curiosity. Fantasy dog beds was the theme and I was excited to see her creation. 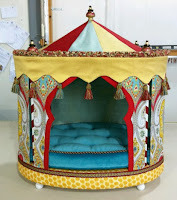 It was no surprise that her Moroccan inspired carousel dog bed got lots of oohs and aahs and won a prize. You don't have to be royalty to love it, but maybe a sultan to afford it. It auctioned at $1200 and a replica costs $2000. Winning Contestant shows the fruits of labor from Alan Schatzberg's workroom with Susan Goldstick carnival finials and Kravet fabric. Photos courtesy of Design Concept Interiors. But actually this is not the first time, our decorative hardware was a key component in a dog bed design. Joanne Mahon, managing director of Diamond Dogs Uk approached us years ago for a "pet" (no pun intended) project. Her company specializes in Swarovski crystal dog collars and she chose our sparkly Isabella finials to crown the posts of her dog bed creation. I admired her philosophy that a dog's bed is a furniture piece and therefore should mirror the decor of the room, hence the rich leather cushions and arms. Privileged Puppy looks happy in leather upholstery and surrounded by Susan Goldstick Isabella finials. Photos courtesy of Diamond Dogs UK. So there you have it, two very unique and very different interpretations of a dog's dream digs. No tired old baskets upholstered with chewed up blankets for man's best friend. However I will caution- my perisian cat would take ownership of these dog beds in a nano second!